INTRAC is responsible for the editorship of Development in Practice, one of the best-known journals in the development sector. 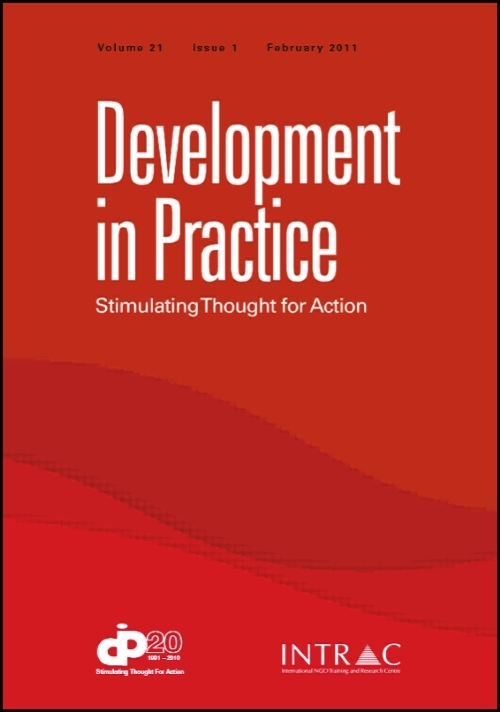 Development in Practice offers practice-relevant analysis and research relating to development, providing a worldwide forum for the exchange of ideas and practical experiences among practitioners, academics, policy shapers, and activists. By challenging current assumptions, the journal seeks to stimulate new thinking and ways of working. INTRAC and Development in Practice share a common commitment to a core mission – to disseminate and share the research and practice of international development to a global audience. As part of this, we encourage you to submit articles for possible publication in future issues of Development in Practice. The journal publishes articles, practical notes, viewpoints, review essays, and literature reviews. To find out more, please visit our publisher’s website and read the instructions for authors. Articles should be submitted via our online platform, Manuscript Central. If you have any queries about submitting an article to the journal, please contact the Development in Practice Editorial Team. The editorial, and one article from each issue, are free to view. You can also browse the full list of open access articles from the journal.